October | 2013 | Crappy Kitchen - Good Dinners! I have found that by mid-week the whole house is in need of a lift. The first few days of work or school are behind us but there are still a few more days before the weekend. I am not one to wish my life away and don’t just live for the weekend but the idea of a little something special on Wednesday (you know, hump Day!) really appealed to me. This is what myself and a friend, who also feels a little “draggy” by Wednesday came up with. At the beginning of the school year we decided that we would each take a turn to cook dinner on Wednesday and would alternate houses. The perfect division of labor was created where the person not cooking would supply the wine! It has worked out great from both perspectives (for me anyway): on the days I cook I get excited about making something special and on the days we are the guests I love the feeling of being off the hook for the night, and I get the fun job of choosing the wine. 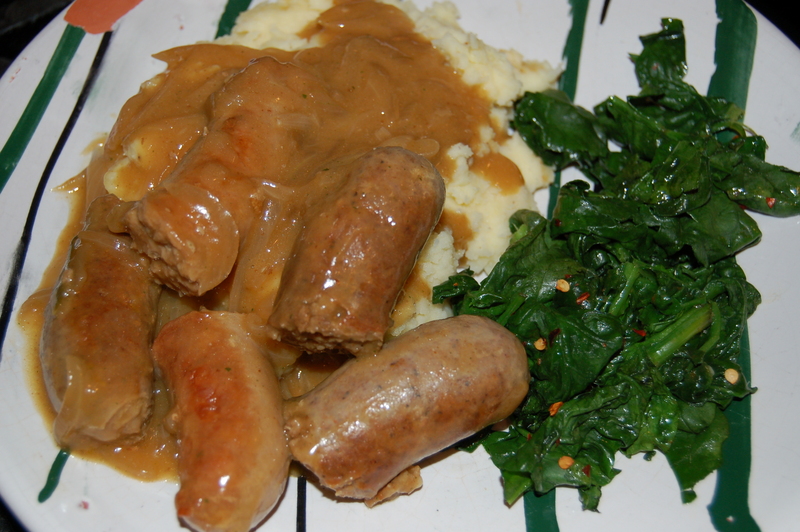 This is what I cooked last Wednesday and it was a roaring success. 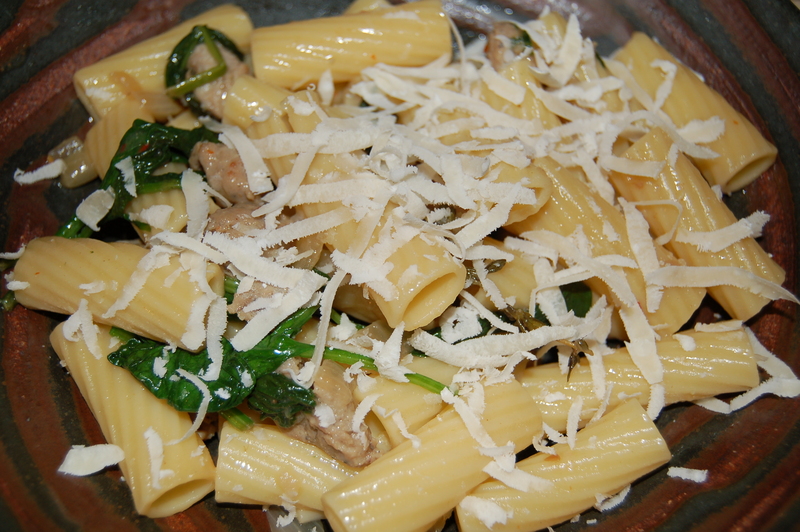 I was inspired to cook this when refilling my pepper grinder with my most favorite pepper, Tellicherry pepper. It is from India and as the aroma of nutty warm heat hit the air I remembered my mother’s white sauce. I barely got a picture of this fab bowl of roasted veggies they were being devoured so fast! She actually used white pepper in her sauce but I was reminded of the peppery taste all of a sudden and that memory was followed by another flashback of how she would smother a piece of baked fish in the sauce most Fridays. 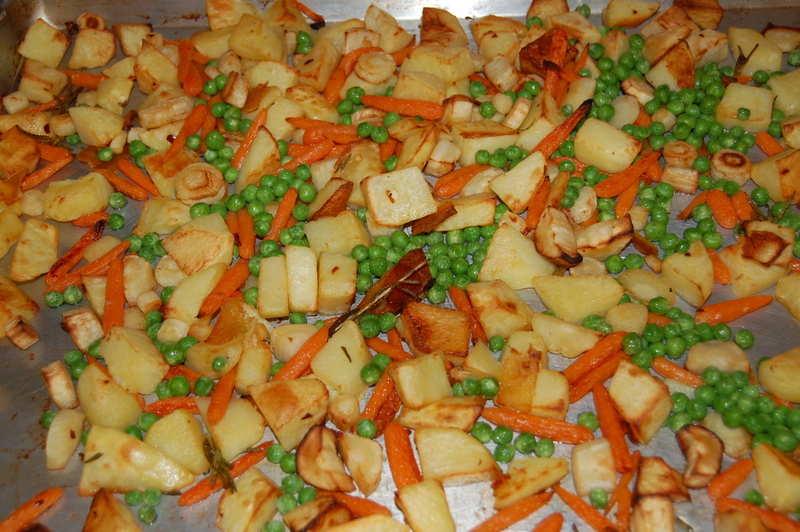 I planned on serving this with mashed potatoes, and carrots with peas but when I got home and thought about all the labor involved I ditched the idea and simple roasted all the veggies together. 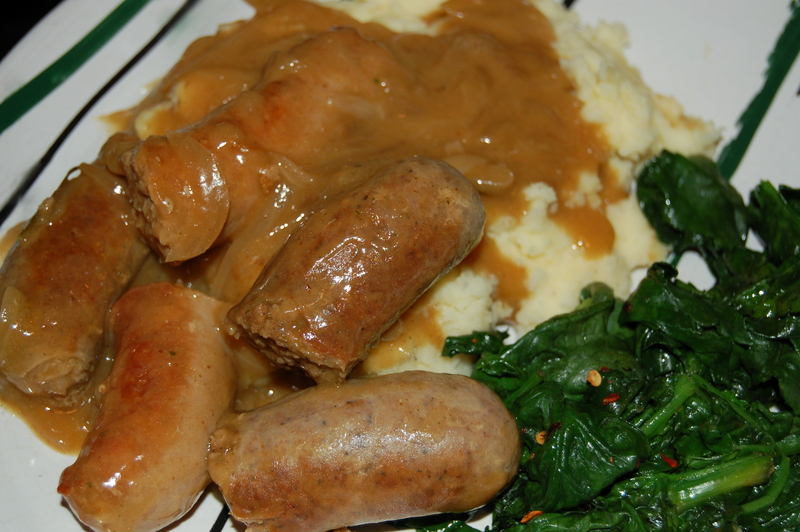 They turned out fantastic and it is one of my best Hump Day Dinners to date! 1 – Take the biggest baking sheet you can find (mine is called a 1/2 sheet and takes up the entire oven space) and add 4 tbs of olive oil over the surface. place in the preheating the oven. While this is going on put the parsnips, carrots and potatoes into a big bowl with a couple of short sprigs of rosemary and a few springs of thyme. Add 4 tbs olive oil and mix them all together to coat. 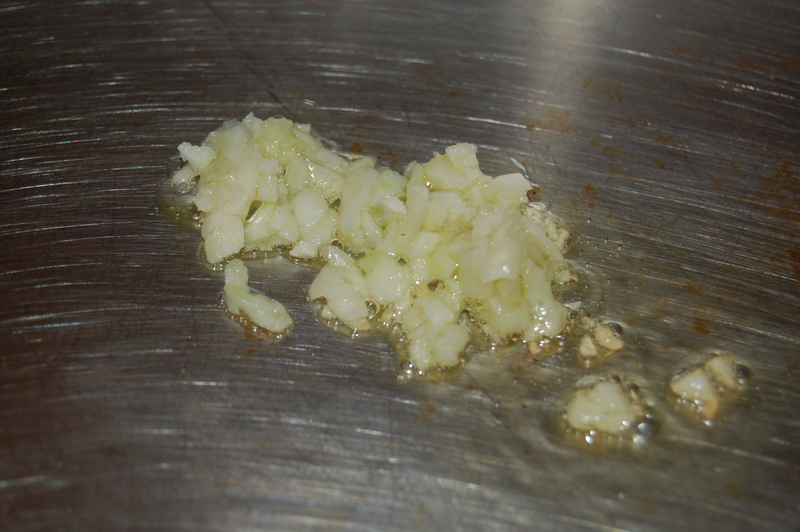 Add 1 tsp salt and the pepper flakes and mix again. 2 – Carefully remove the hot baking sheet from the oven and spread the veggies in an even layer and place back into the oven. Let them cook for 15 minutes, take out and toss and flip them. 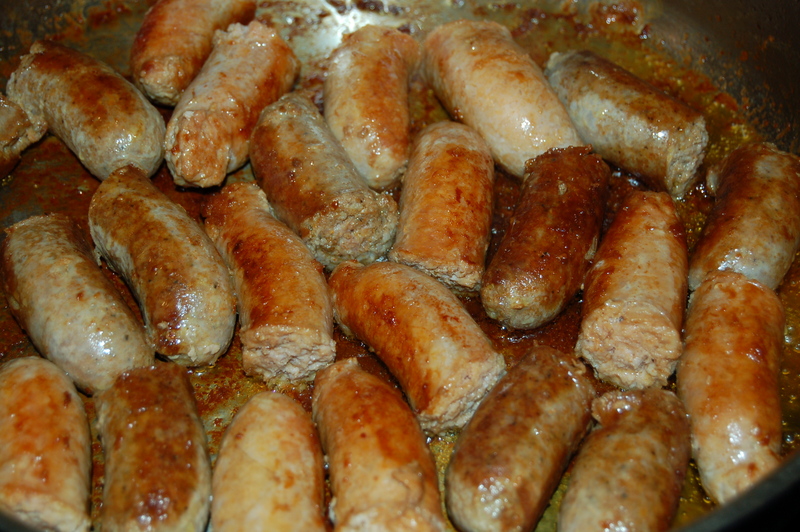 3 – Place back into the oven for another 15 minutes after which time they should be just cooked. 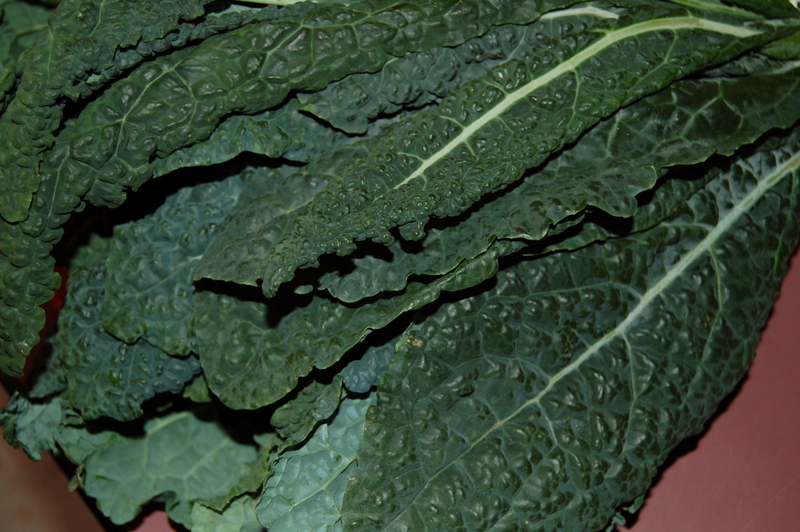 *10 minutes before veggies are done place the frozen peas in a heat-proof bowl and add boiling water. Let them sit for 5 minutes. Strain off water and add a little olive oil and toss to coat. While the veggies are cooking, get busy with the fish and sauce! 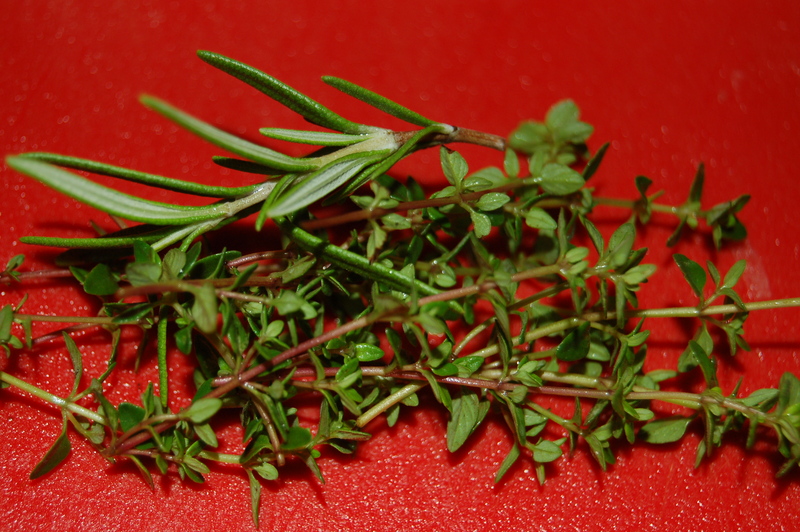 1 – Place the halved onion in a pot with the milk, a few thyme sprigs and little short rosemary sprig. Add 1/2 tsp salt and black pepper corns. Add the fish pieces and place over medium heat. When milk begins to boil, turn the heat down and simmer until fish is cooked through – no more than 4 or so minutes. 2 – Remove fish carefully from the milk to a plate or shallow pan with a large slotted spoon or flat spatula and cover with foil or saucepan lid. Keep warm on the stove top or in low temp oven (lowest setting it will go). 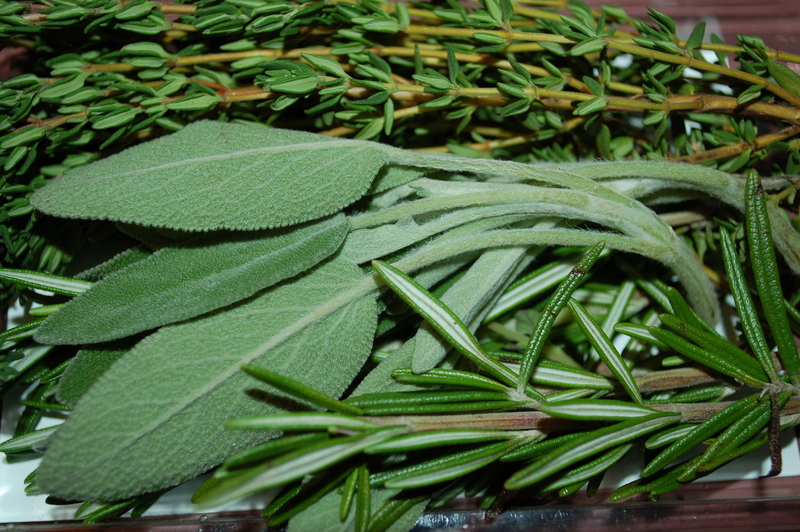 3 – Strain the milk to remove the herbs, onion and peppercorns and set aside in a jug or bowl. 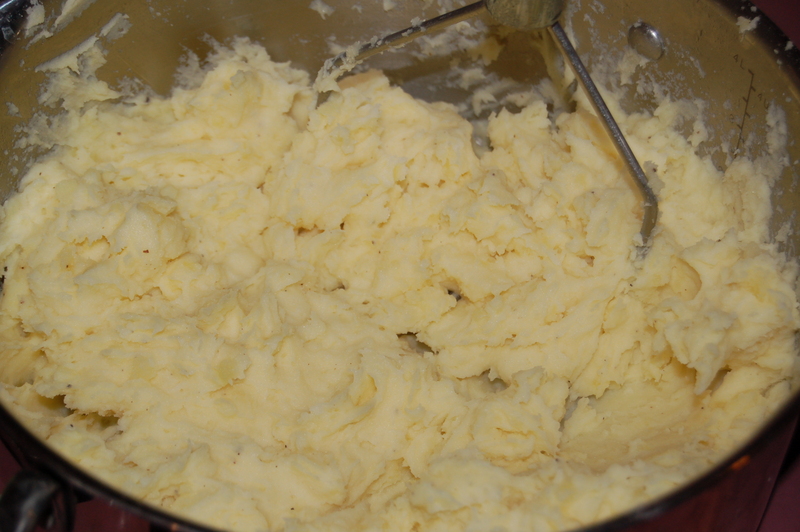 Put a saucepan on low/med heat and add the butter. 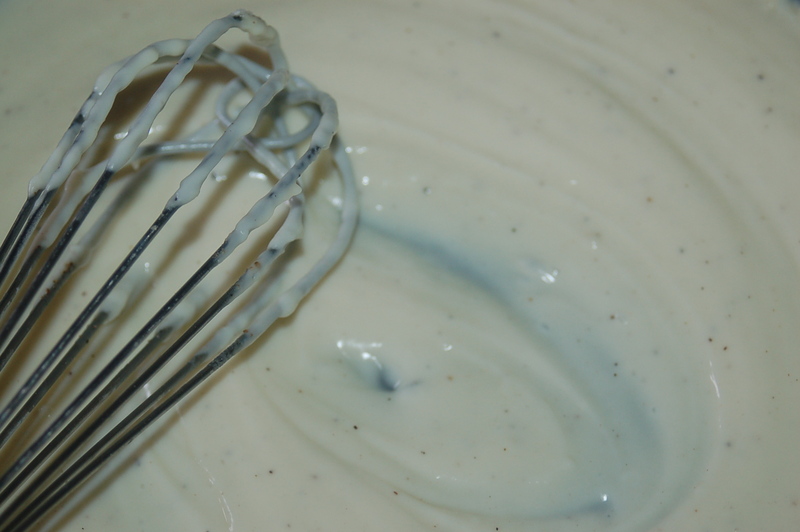 When it has melted add the flour and stir quickly and immediately with a whisk until it is smooth. Add the fishy milk 1 cup at a time, whisking in-between each addition. Add a 1/2 tsp of salt and lots of freshly ground black pepper and cook on low heat, stirring frequently for 15 minutes or until sauce thickens. Taste for addition of more salt and pepper according to your taste (we wanted it very peppery!). Also add more milk if you like a thinner consistency. cook for about 15 minutes..
To serve simple put some fish on each warmed plate (a warm plate is the nicest thing in the world! 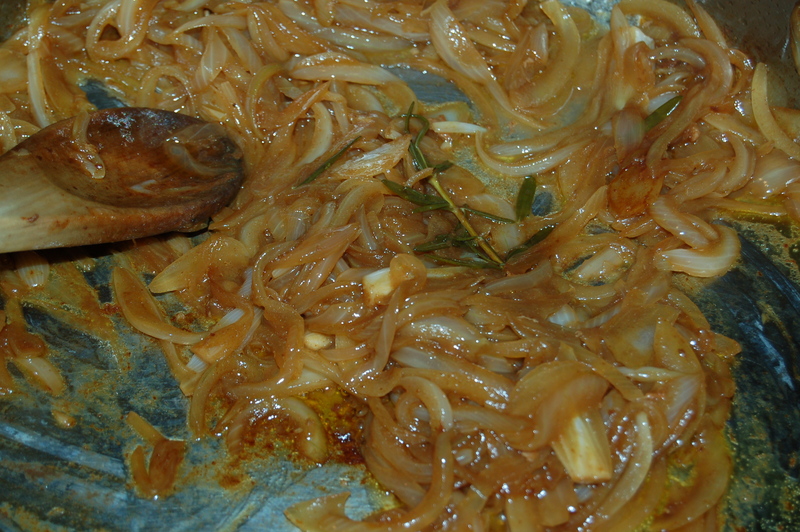 ), and spoon a nice amount of sauce over the fish. I served the veggies in a big warm bowl on the table and let everyone help themselves! 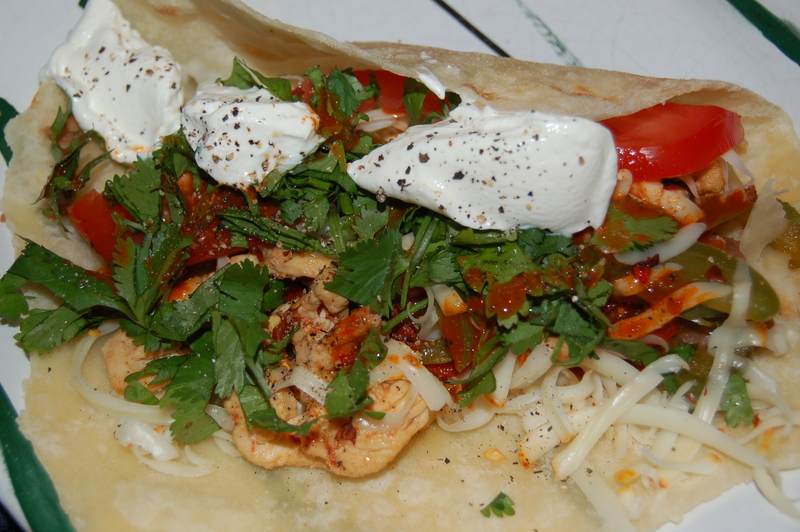 The last time I posted a recipe for chicken Fajitas was over 2 1/2 years ago so when I launched into making them this past Sunday I decided it was time to pay this supremely delicious dish another visit. Everyone in our house has a handful of favorite dishes and I try to make sure to rotate these special dinners to please every palate. Lots of times my decision to please one person over another is determined by what kind of day that person has had or if it is a special occasion just for them. If my daughter has had a tough day or a day when she deserves a reward for being the best daughter even for one thing or another, then I make her favorite dinner. The same goes for my son or husband or a friend who comes to dinner and I feel like pleasing them especially just for being around. 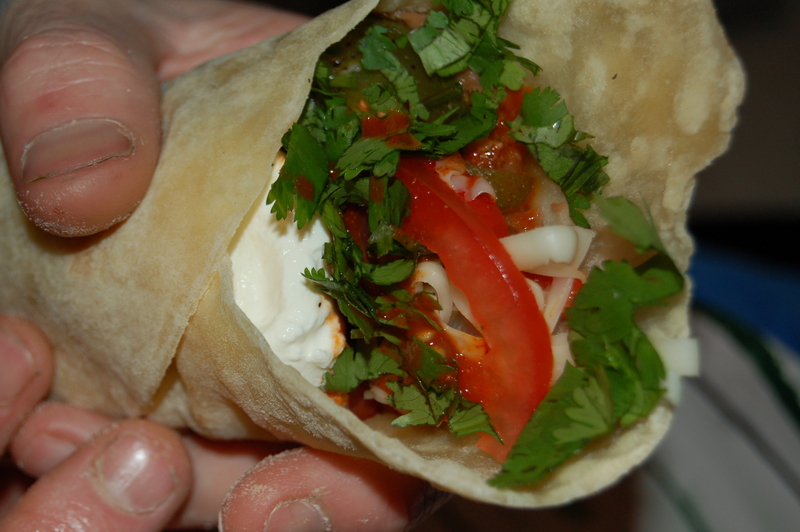 The key component is the homemade flour tortilla – there is no substitute! I know what everyone likes and there is nothing more gratifying to me than seeing a happy face when dinner shows up and it is just for them. This particular labor of love, the Chicken Fajita Dinner, is for Dave. I know for absolute certain it is his choice every time if I am taking dinner requests, or it’s his birthday dinner or even the last meal he would like to eat before he dies! He said he could eat chicken fajitas every night if it were up to him. Besides the fact that he would learn to hate them if it is all he had to eat, they are also a laborious dish to make. It is not that they are difficult, just that they take more time than I am willing to spend on dinner on a daily basis. The best way to tackle a meal like this is to prep some of the ingredients ahead of time if you get the chance. If you do this all at once, it is an undertaking. Of course the reason this dish is complicated is because I insist on making the tortilla from scratch, but it is also the reason they are so delicious and worth making in the first place: a total catch 22! 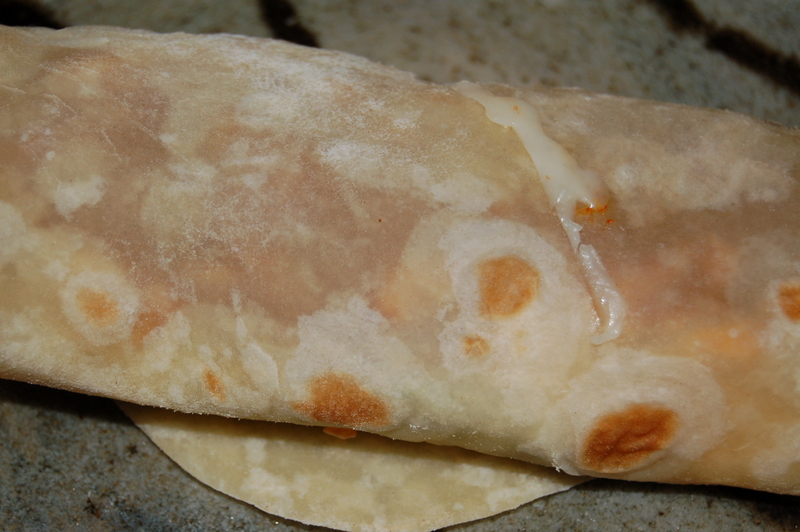 The secret to a great quesadilla is the homemade tortilla! It is work but if you want to hang out in your kitchen with a few friends (or blissfully alone) making this dish is deeply satisfying. This is one of those dishes were the pleasure of cooking it is equal to the pleasure everyone gets from eating it – Provecho! 2 cups refried beans ( I cheat and but a can, but feel free to boil pinto beans according to instructions!) warmed. 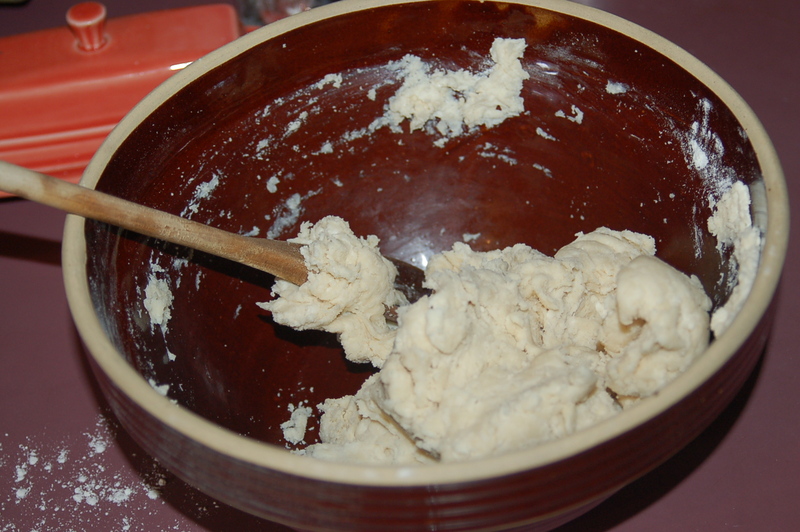 1 – Put flour and salt into a bowl and stir together with a whisk. 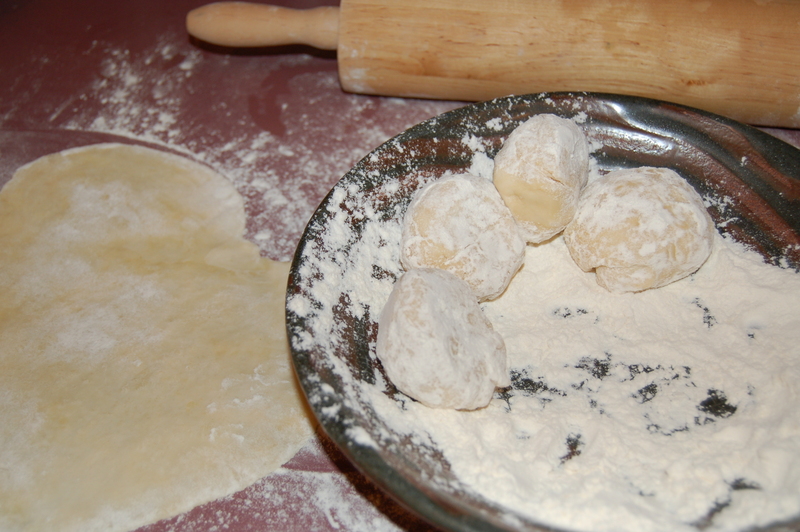 Add the shortening and rub it into the flour with your fingertips until it is incorporated. Make a well in the center and add the warm water. Mix with a wooden spoon until it come together. 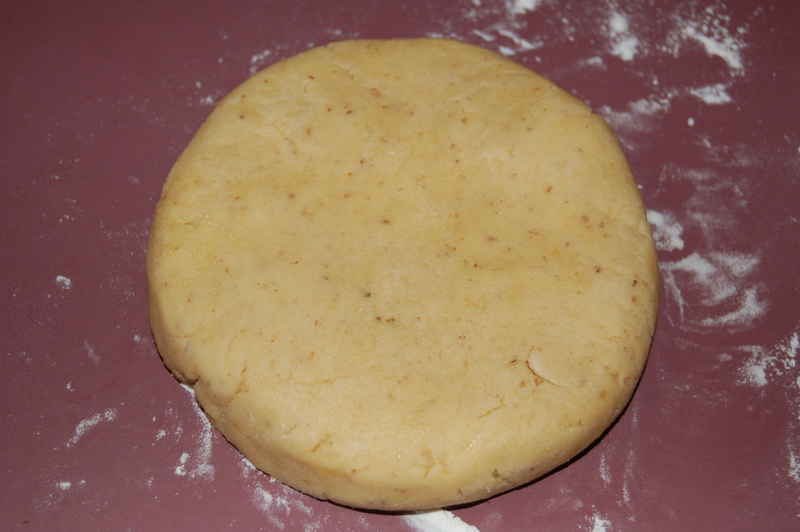 2 – Turn out onto a floured surface and it a little bit. Roll into a log. 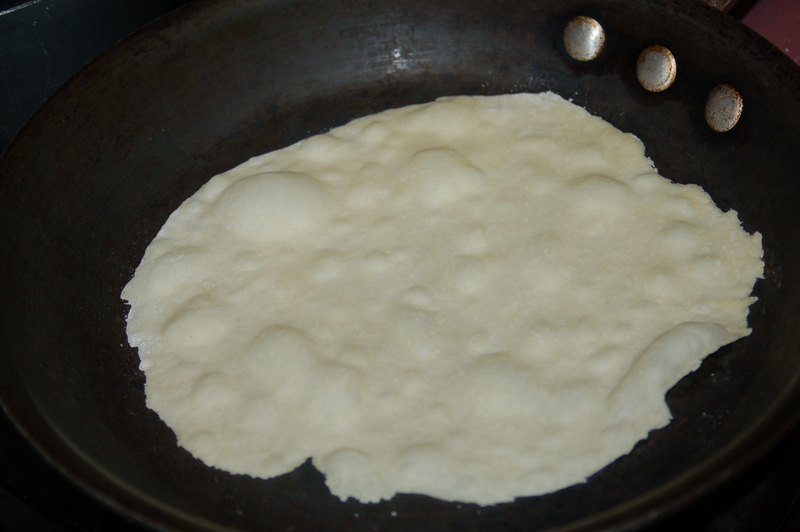 5 – Put a skillet onto just slightly under medium heat and when it is up to temperature add a tortilla. 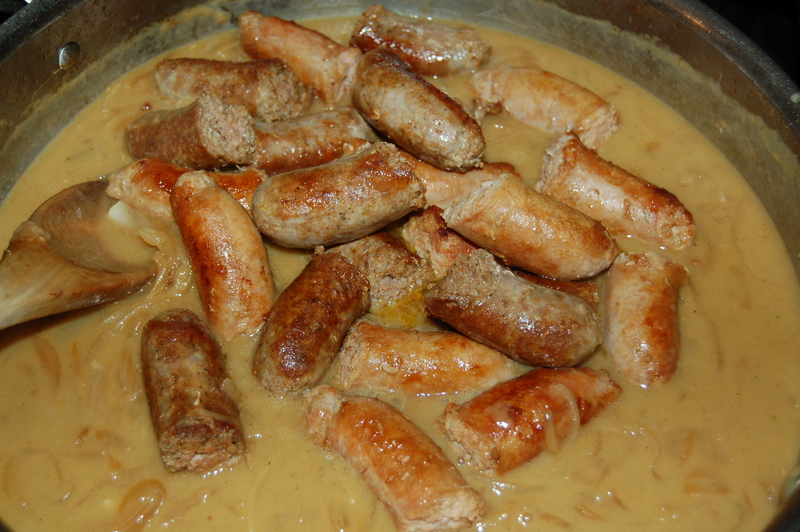 cook until it begins to puff up in spots and then flip. 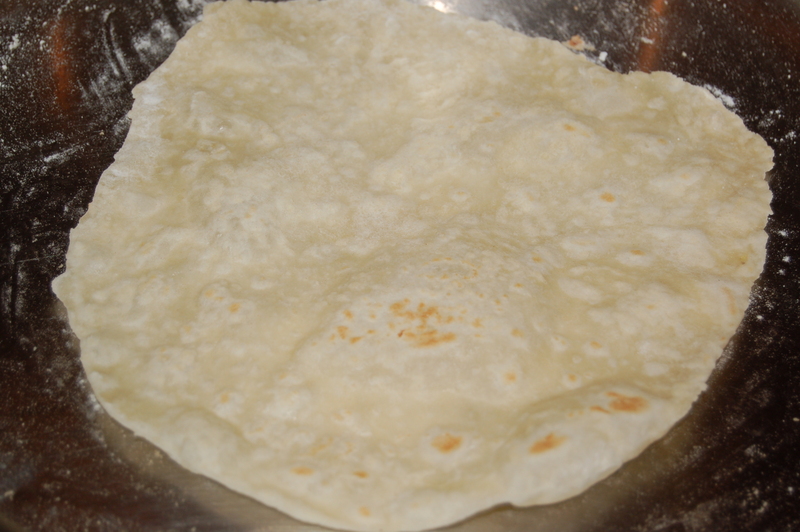 6 – Cook until browned in spots (under a minute) and remove to a paper towel or cloth and cook all tortilla (stacking between cloth or paper towels) until you have cooked them all. They will keep warm like this while you cook the filling. 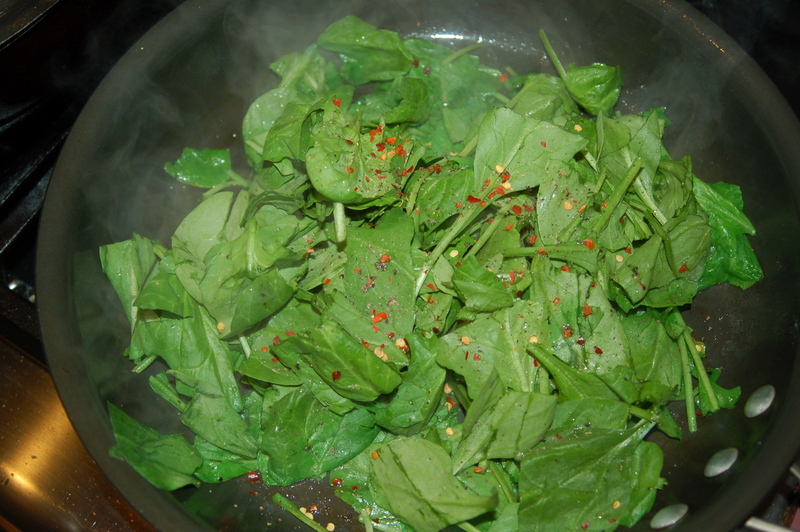 2 – Put saute pan on high heat and add 2 tbs vegetable or olive oil. 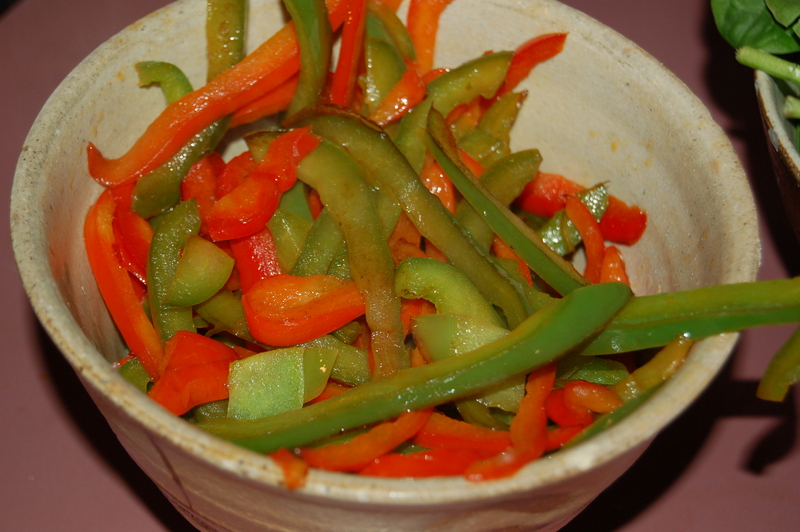 when it is hot add the sliced peppers and cook quickly – about 3 or 4 minutes. 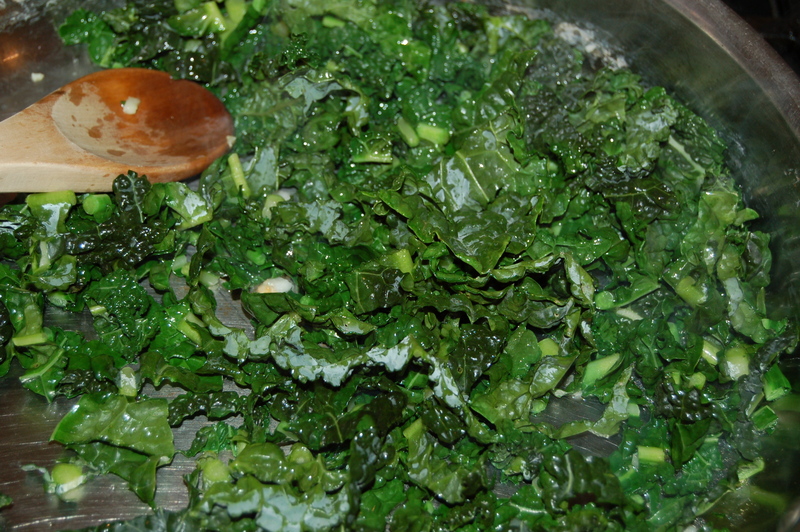 Remove to a bowl and set aside. 3 – Add some more oil to the pan (about 1 tbs) and cook the chicken in batches until done. The chicken will not cook correctly if added all at the same time (it will become too moist and cook slower and become tough). Each batch should only take 3 to 5 minutes. I like to let everyone do their own. It’s more fun for them and less work for you! I usually start with the bean, then add some chicken and peppers, followed by spinach and/or cilantro, cheese, sour cream and topped with a drizzle of tapatio sauce. Wrap it up and enjoy! 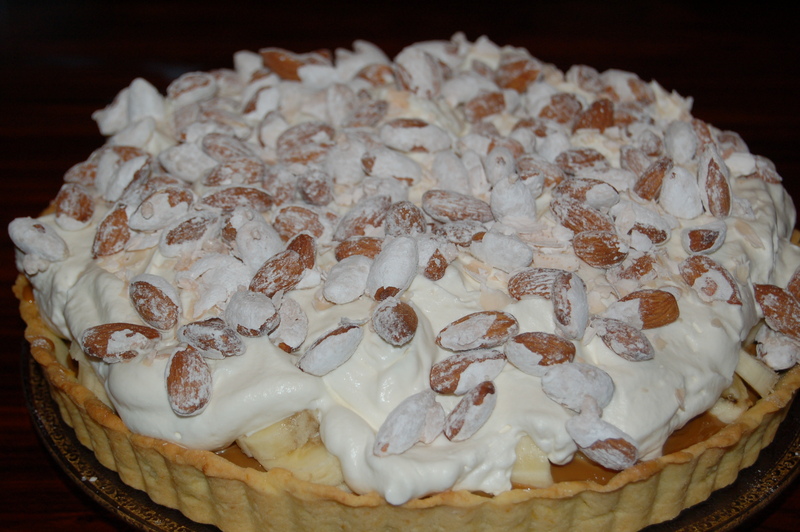 If you haven’t had Banoffi Pie you are missing out! This pie was all the rage in Ireland and England a few years ago (around the same time as the Crème Brûlée craze and preceding the Tiramisu and Cupcake trend). It was on every dessert menu in the country, similar to how french pastries have fallen back into vogue these days, especially the delicately scented macaron which comes in an array of colors that make rainbows look sad and dun! (I wrote about them HERE if you are curious, and HERE!). You need to leave room for this! I will agree wholeheartedly that the name of this cake is a bit corny, like the words “spork” (for fork and spoon), and skort (a word I find utterly ridiculous – combines shorts and skirt, oh, and have you heard of “jeggings”? – too idiotic to explain ) and even Brangelina! As a general rule the latest of these stuck-together words (called portmanteau if you are interested, although you probably already knew that!) are pretty silly. I need to go on a bit here: the word Traduken in the culinary world for example – nothing could be sillier. It is officially a chicken inserted into a duck which is then inserted into a turkey and cooked! It might be delicious and one day I might try making one, but only after I can get over the word itself. Some of these words are quite inventive and it is a fun word game to play, but the one that is near and dear to me is when my mother asked if I could make her a “pignet” ring? Really? “Yes”, she said, “it is a signet ring for your pinky finger” We laughed so much about this and it became a real word to us! It is such a trendy thing to do nowadays. I think the word for portmanteau in the food world is “fusion” Okay, I’m done! 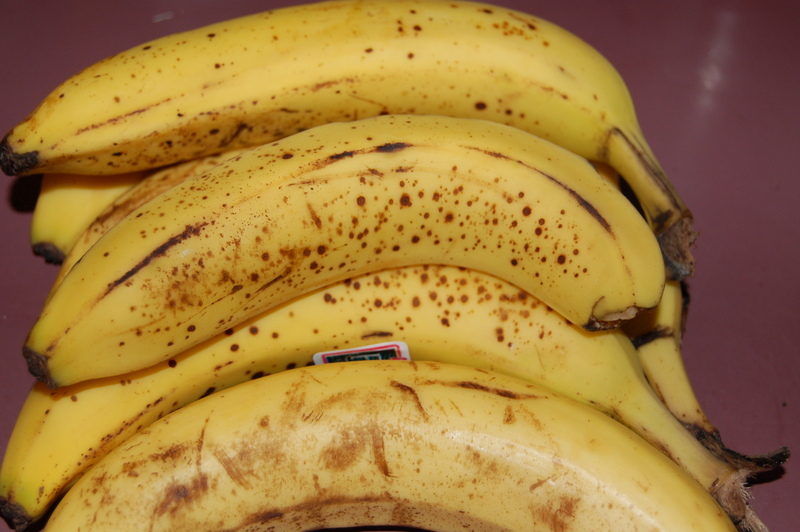 key ingredient: Bananas, the cheapest fruit on the planet! 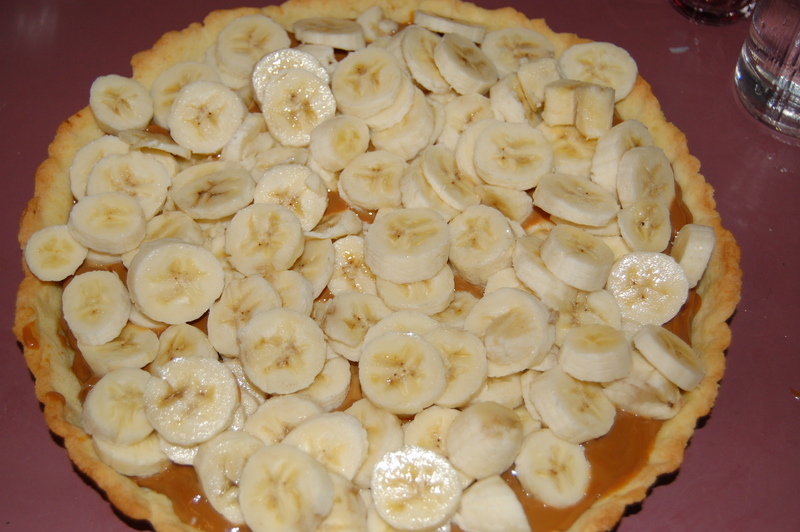 So at this point you can guess the ingredients of this pie…BANana and tOFFI (EE)! 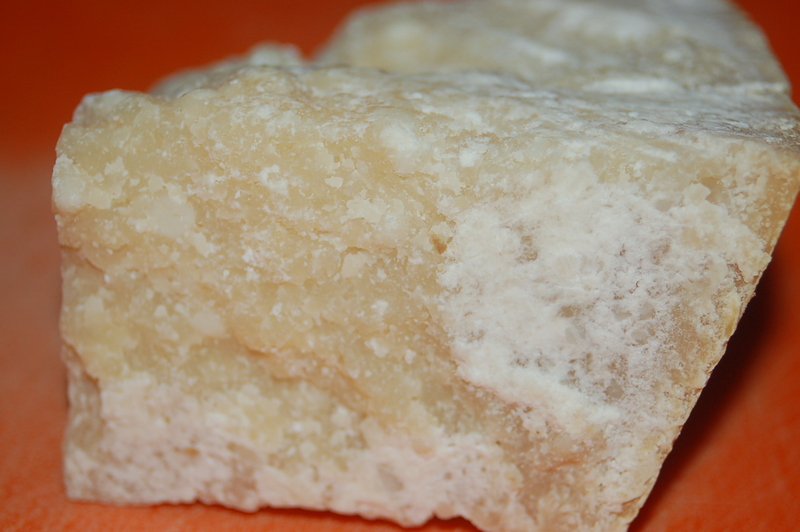 It is a marvellous combination of sweet stuff and I would love you to give it a try. The toffee can of course be purchased in a pinch but the most fun you can have and an excellent magic trick to show your children is to make it by boiling a can or two of sweetened condensed milk until it turns into toffee right before your eyes. (instructions are in the recipe below). There are all sorts of ways you can make this your own. 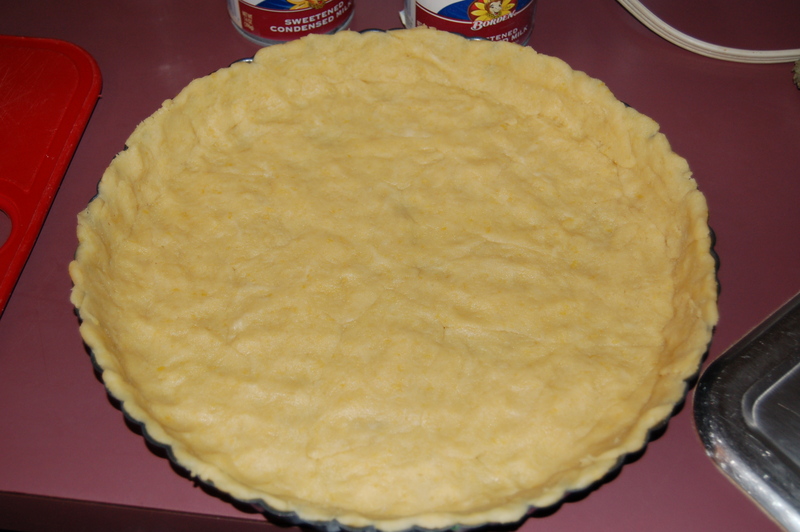 I would use whatever sweet pastry crust that works for you (mine is below and is as easy…well you know). 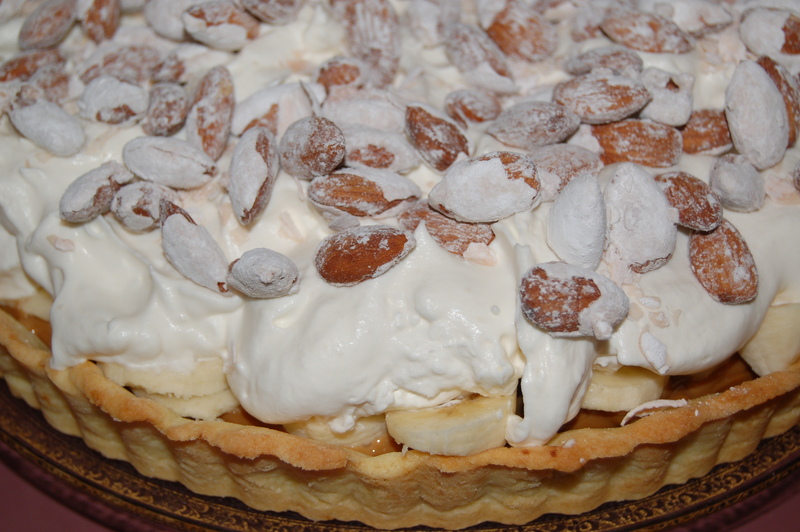 I have had it with slivered almonds on top but I made it here with whole almonds, or you can omit the nuts altogether for that matter. Also there is an option to drizzle the bananas with a concentrated instant coffee (it’s simply a mixture of instant coffee, water and sugar. It is called camp coffee, a throw-back from world war II when things were in short supply and us humans became ingenious at figuring out how our food could still feel “the same”). Well you could do that or sometimes I just add some vanilla extract to my whipping cream and that is delicious too (also small kids seem to like this subtle taste better). The last thing to say is that this whole dessert could be bought and assembled, from the pastry crust to whipped cream from a can, although the idea of cream from a can still repulses me so I would probably end up having to pull out my hand whisk! 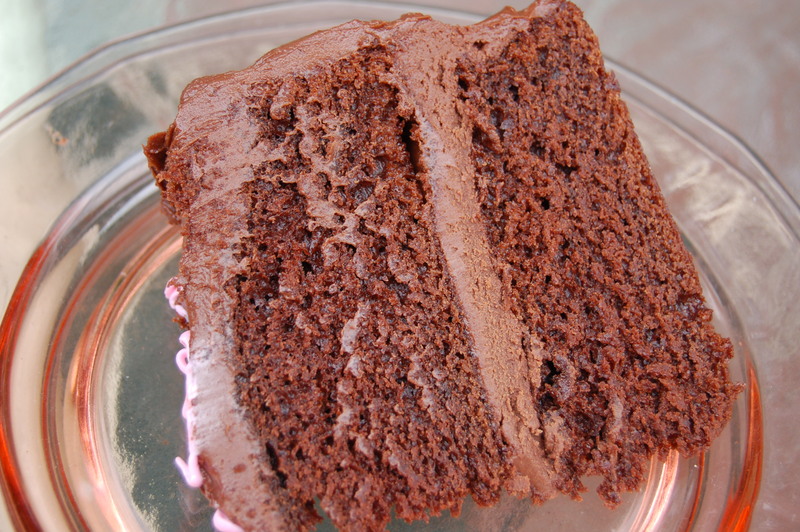 But if that is all it took to get something as decadent as this onto the table in a hurry I would be willing to do it. A little of this goes a long way so just one pie can feed a crowd. It is a long weekend in these here United States so why not plan to make this one night to give the weekend a more festive air. 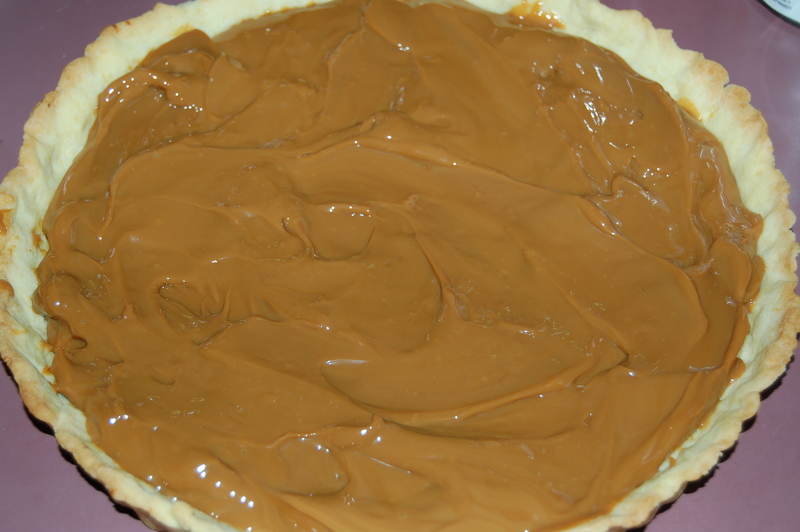 Equipment: I used an 11″ fluted pie pan with a removable bottom. this is very handy when dealing with fussy toppings as you can remove the pie without any bother. 1 tbs Camp Coffee (mix 1 tbs instant coffee with 1 tsp fine sugar and 2 tbs water) – optional. This recipe can be used here or the cooked cans can be popped into the pantry (will keep for two months unopened) or the freezer (will keep for 6 months) to be whipped out anytime. There are all sorts of uses for this so boil up as many cans as you like! 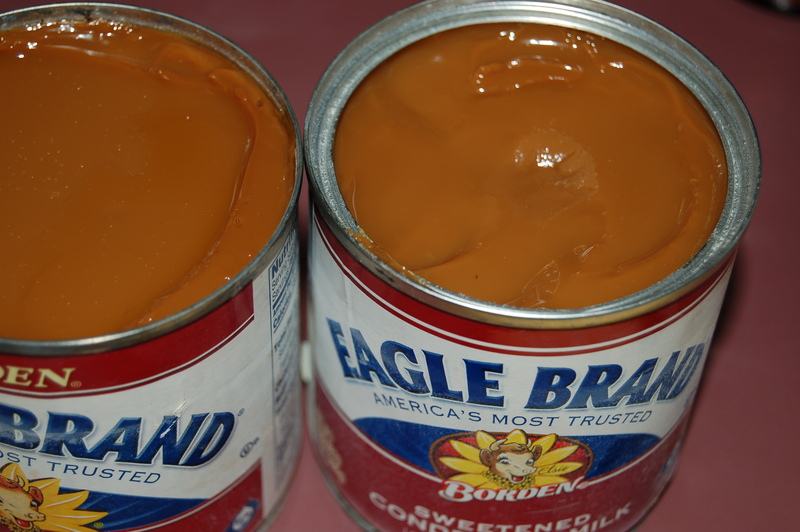 Put at least two can of Sweetened Condensed Milk into a big pot and add water until it comes up to the top of the cans. 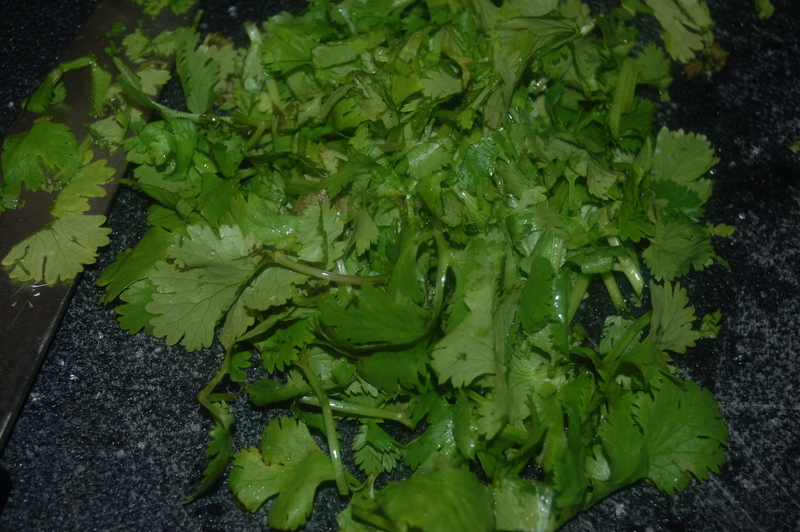 Place on stove top on high and allow to boil. Turn the heat down until the water comes to a constant “tremble” and boil for 4 hours, making sure to keep the water topped up as it boils off. Remove from water, let cans cool before opening and using. 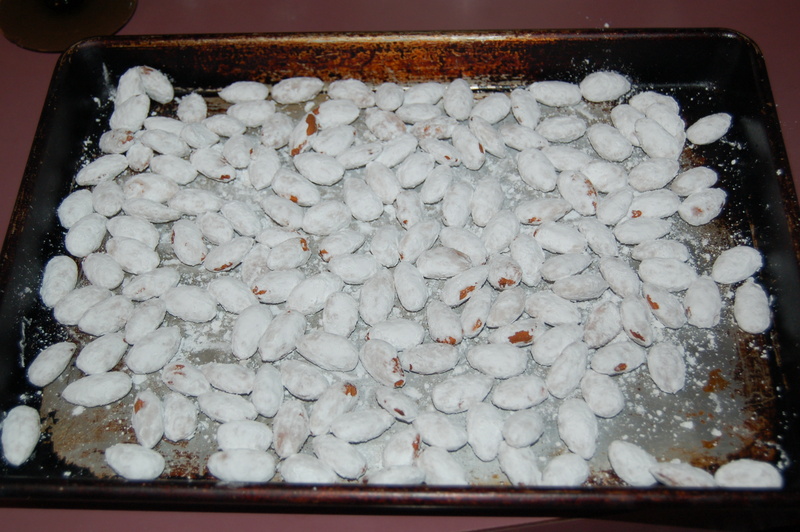 4 – Run the whole almonds until water until they are wet. 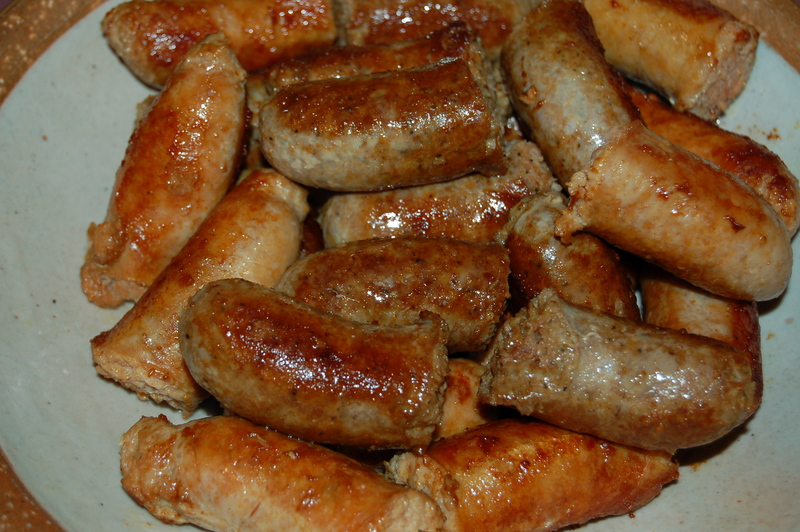 place them on a tea towel and pat dry. Place them in a bowl with the confectioners (icing) sugar and stir until the nuts are coated in sugar. Spread out on a baking sheet and place in the oven until they are crispy looking. This will take anywhere from 12 to 18 or so minutes. Turn the almonds every five minutes so they cook with an even crispy-ness. Remove from the oven and let them cool. 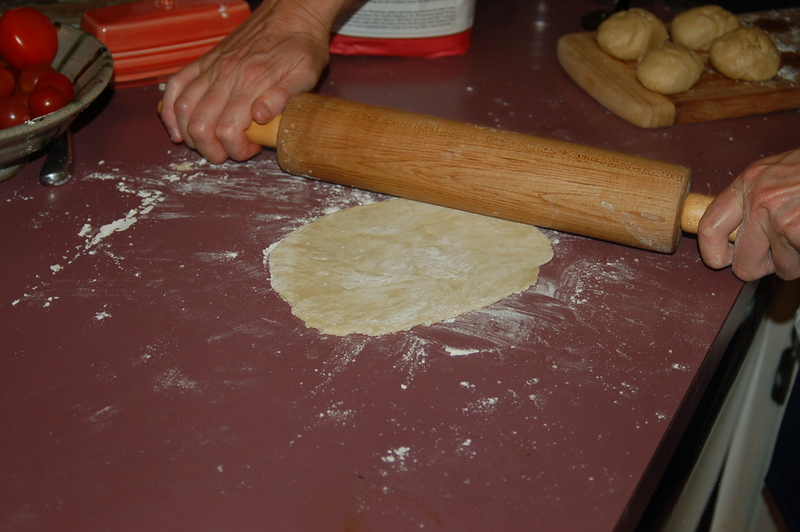 5 – Take the pastry crust from the fridge and using a rolling-pin on wax paper roll the pastry out into a large disk (an 11 or 12 inch circle) and line your tart pan, trimming off the excess edges. Prick holes in the bottom of the crust with a fork and then place some wax paper or tin foil over the sides and bottom. 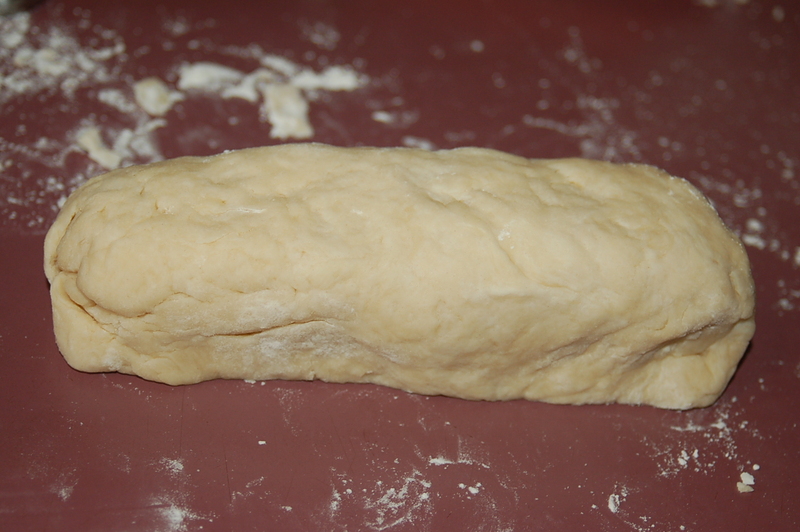 Weigh the pastry down with dry beans (or pastry weights if you have them) and bake in the oven for about 12 minutes. Remove the beans and the foil and place back into the oven for another 4 or 5 minutes. Remove and set aside until ready to fill. 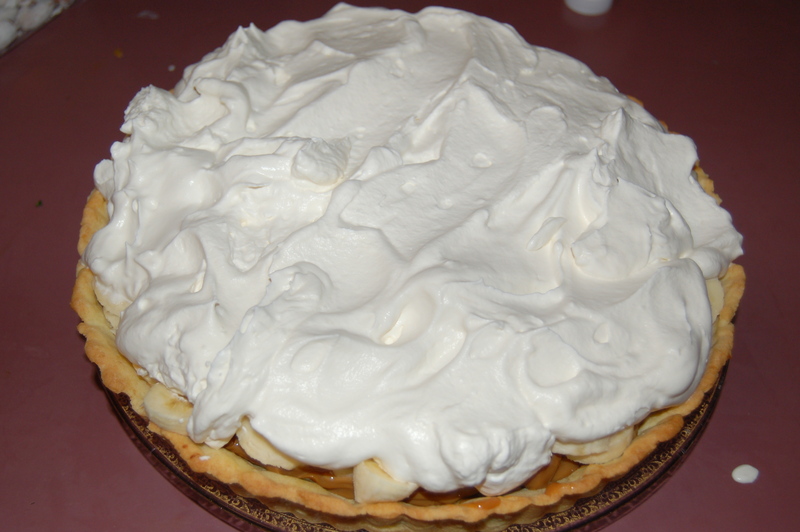 6 – While the pastry crust is cooling slice the bananas, whip the cream,(whip with or without vanilla extract), make camp coffee (if using), open cans of toffee. 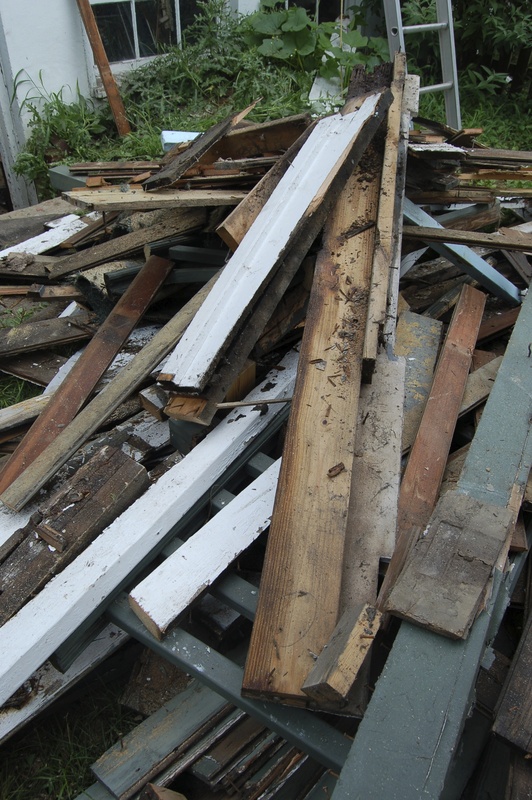 Big News: The Crappy Kitchen IS NO MORE! (well very soon anyhow) But The Cooking Goes on! Let me clarify the title and tell you that I am talking about my actual Crappy Kitchen being “No More” and Not The Crappy Kitchen blog itself. 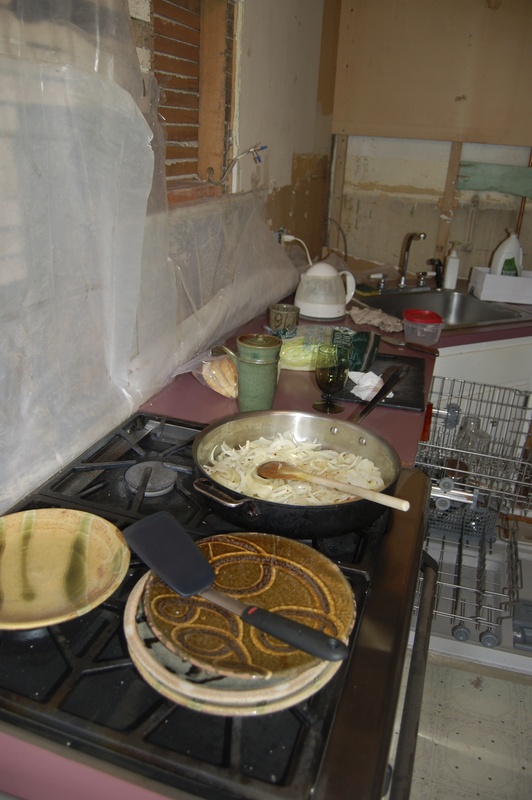 So food will still be cooked and written about but the kitchen will not be as crappy! As I write this there is a deafening sound coming from the kitchen in the form of a power-driven chisel painstakingly chipping 1970’s fake brick and 105-year-old plaster (which consists of mortar mixed with horse hair if you’re interested) from the walls. I don’t even want to think about the minute particles of dust going into my body right now. However, I’m willing to suffer as I have waited exactly 11 years for this to happen: yes, the Crappy Kitchen is undergoing serious plastic surgery and if all goes well it should come out looking 30 or so years younger, or at least stop looking like it’s from the “70’s! The last month or so have been hell (of course I’m exaggerating as hell is rumored to be quite unbearable) but I have never been happier. The place looks worse than ever but as you know, if you have ever deep-cleaned your bedroom or bathroom, you have to make a big mess to come out all shiny and new on the other side. 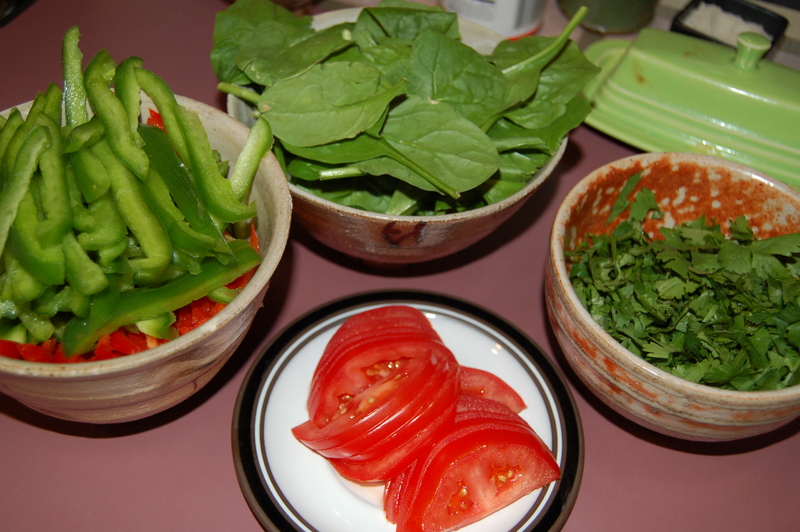 A few revelations have come from this bit of upheaval which I would like to write about: first, one can cook dinner on a square foot of clear space, and secondly I have answered my question of why I write this blog! I stopped writing when the first bits of wall began tumbling to the kitchen floor, but that did not mean that the cooking stopped. I had no intention of ordering in for dinner each evening so the rule was, no matter how debris-ridden the place was after a day of work, it would be cleaned up enough for me to used my big saute pan on the stove top and there would be a place to put a chopping board. The writing stopped at the beginning of this whole project because I was a bit protective of my new camera. My old camera (a Nikon D50 if you are curious) had been literally attached to my hand for the past 3 years and looked like that baby toy that every girl and boy seems to leave childhood with: sadly tattered and worn but too precious to be replaced. It was a highly abused piece of hardware and when I was told time and time again that I should treat it like a camera (you know, put the lens cap on after each use, set it down carefully, don’t leave near frying or steaming food…) I defending myself, and my camera for that matter, by arguing that this was more than just a camera, that it needed to be on hand at a moments notice (hence always having it swinging from my shoulder with the lens cap off!) to take pictures of food wherever it happened to be: my kitchen pretty much every night during my normal life, in restaurants (most memorably, Ireland and Italy in the past two years) and when my cooking took me to precarious places like a stone wall or beach with a two-plate camper burner on my back. 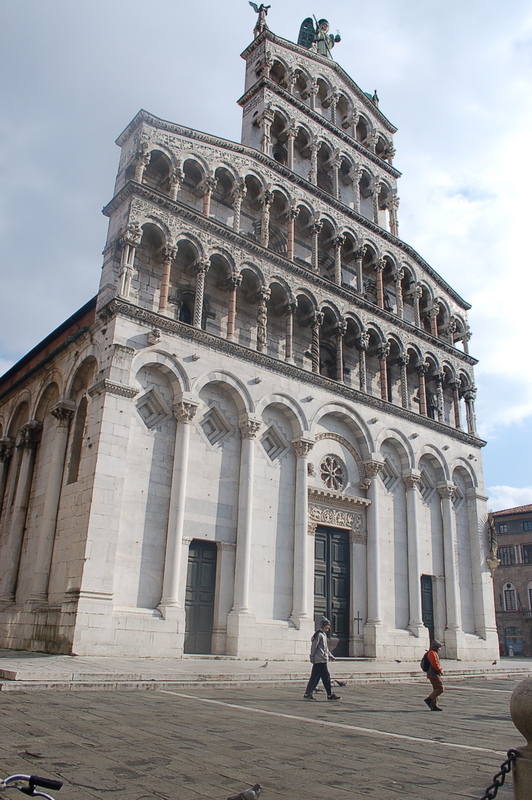 In these cases a camera has to be willing to take a bit of rough handling, although I did not mean to throw it over that high gate one evening in Cortona before I climbed over it myself resulting in a smashed glass lens ( I was full sure it was on my shoulder when I made the climb, and that’s a whole other story in itself! Oh and I continued to take pictures for another year or so after that without the protection of a glass lens cover – worked fine!). Suffice is to say when I shelled out for a new camera I started out by treating it like my friend with her new car. When my friend got a brand new car in pearly white she would park it in some deserted part of the parking lot or garage away from any other car for fear it would get scratched! I would tease her about her long trek to get to it when leaving her after a bookstore or cafe excursion. I knew her overly protective beginnings would give way to slowly treating it with a little less caution, as surly as I knew I would eventually end up setting my camera down on the spur of the moment beside the kitchen sink while I deftly pulled something out of the oven before it overcooked (incidentally I met my friend yesterday and when I left the bookshop her car was in the very first space!). The point is, my initial caution stopped me from taking pictures (I happen to buy my camera just before the renovation), which in turn stopped me from writing about my dinners. At the beginning I missed the whole ritual of taking pictures and then recording the event or experience, or whatever you want to call it. I wondered if anyone wondered where I had disappeared to, which in turn got me thinking about why I write in the first place, or more importantly WHO did I write these sometimes long and time-consuming food-related meanderings to? a little dancing before the wall goes up! The only way to figure it out was to make the decision not to write it for a bit and see if my answer would come to me. It was a good time to take a break as the kitchen was a sometimes intolerant distraction, but I was also newly busy with a new business venture which is still keeping me up at night these days! Anyway, I will leave that question for now to say that despite the rolls of plastic barricading the kitchen from the rest of the house, and the fact that my entire kitchen had been emptied of pots, pans, all food and serving paraphernalia to its new temporary space on bookshelves, sideboards and any empty surface in my dining and living rooms, the cooking still went on, or should I say goes on. The trick at the beginning, when the kitchen was just about off-limits, was to conjure up dishes that required just one pot from start to finish. That meant, no little sauce pan or pan to saute something last-minute, or God forbid a meal like roast tenderloin, mashed potatoes, gravy and garden peas! Luckily I am more of a one-pot sort of cook where fussing with pots is just something I do on special occasions, or when I feel like being holed-up in the kitchen for hours in order to scrounge some peace and quiet! 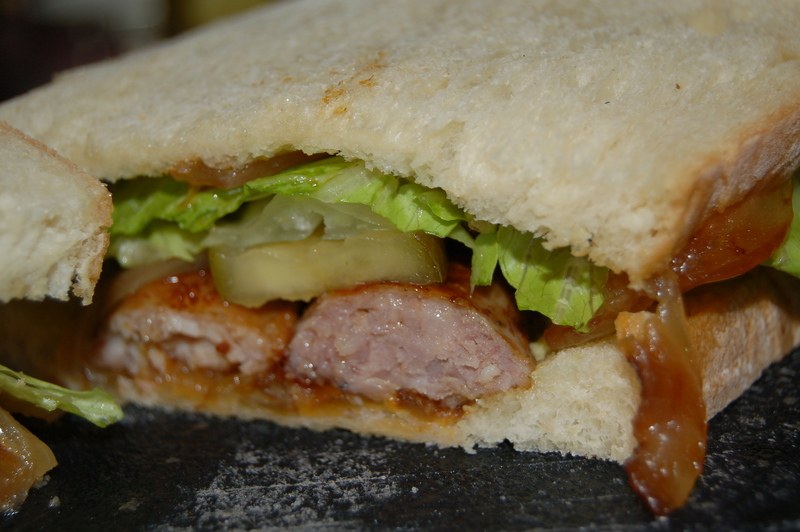 I cooked this during the height of the demolition – and it was good! The hassle of this new routine is that now ingredients and kitchen tools are not at my fingertips. For a person who generally cooks on the fly it has the tendency of squelching my creativity, giving way to more planned out sorts of dishes. I have to think about what I want to make and then go around the house gathering the things I need from hither and yon and then staying put. Of course that never completely works out as I always forget something and have to go flying out of the room for a spoon or pot lid. The worst part is that half the time I leave to get something I end up standing in the middle of the room surrounded by my organised piles wondering what I left to get in the first place. quite the industrial look (the trick was to put everything on little squares of paper towels to keep the dust off the glasses and whatever else). That said I have to admit to loving the madness of it all. I liked having to stick to a tiny space in which to chop ( making sure that the raw chicken or fish was the last thing on the chopping board or else I,d have to use two!) and prepare and it curtailed my tendency to leave spoons here and there on the counter top, and in general be a more compact cook. I feel that I now have the training necessary to cook in the kitchen of a tiny sailing vessel! This is what was under our fake brick wall: real brick! 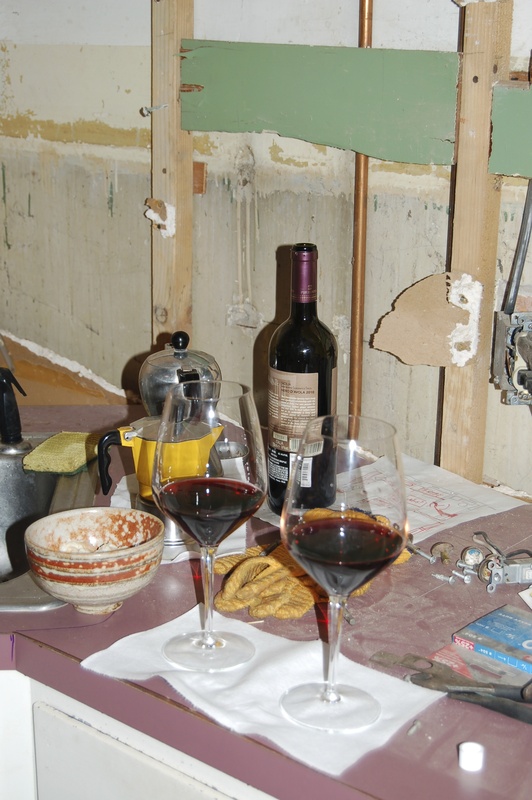 I also love the visual of food cooking and glasses of wine against the backdrop of a construction site: the exposed walls, the torn-out cupboards and counter top, with ladders propped up here and there and the smell of newly sawn wood and fresh paint hanging in the air. I’m sure to get sick of it at some point, but for now I am quite content to step over a tool box or lay down a piece of paper where I need to lay out the ingredients for the nightly dinner or breakfast as the case may be. Let’s see how I feel about this if I’m still living like this near Christmas when I most certainly plan on having more than one pot on the stove at a time! 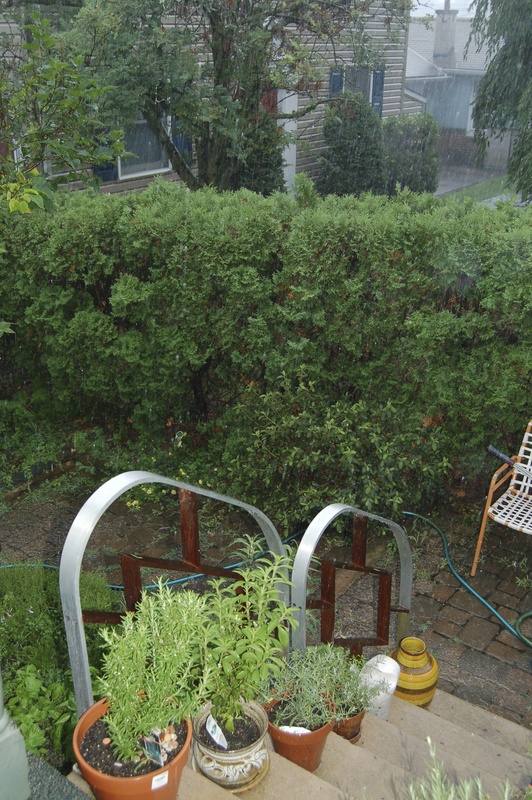 I was obsessed with saving my herb garden and sprayed the dust off of them each evening when the work came to a halt. This whole upheaval has further convinced me that you don’t need a fancy place in which to cook good and delicious meals. I’m newly convinced it is all about 1 good knife and a sturdy saute pan that can do the work of 10! The only thing that has unnerved me is the fright I get when the occasional bit of loose plaster or gravelly brick falls from the ceiling or walls. I’ve been hit on a the head a couple of times but luckily nothing has found its way into anyone’s dinner! 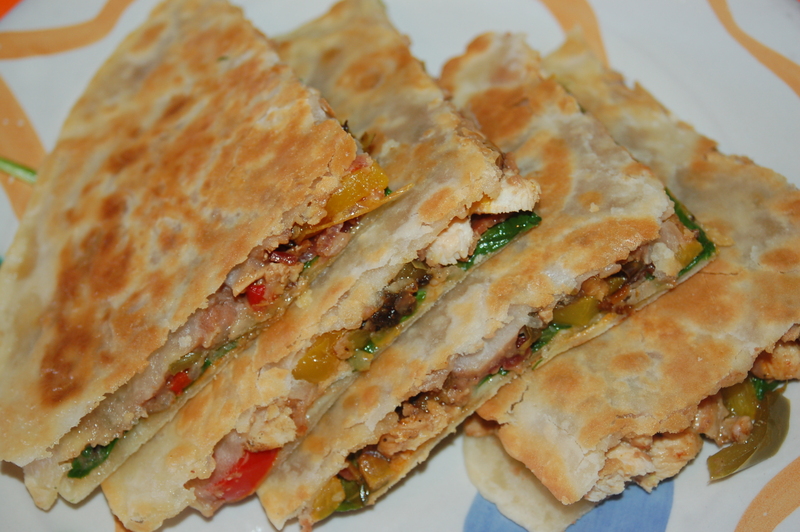 I cooked these great sandwiches on the pan one night! I have cooked all sorts of pasta and stir fry dishes, soups galore, meatloaf, battered fish, made fresh tortillas and even a few fabulous desserts in the settling dust of my kitchen construction zone. It all takes a little more time, and cleaning up and then trailing out of the kitchen to put stuff away is a tedious pain, but it is all worth it. We get to eat good food each evening and the smell of home cooking gives everyone a sense of normalcy, something I find my children are in desperate need of after a day of school and homework. 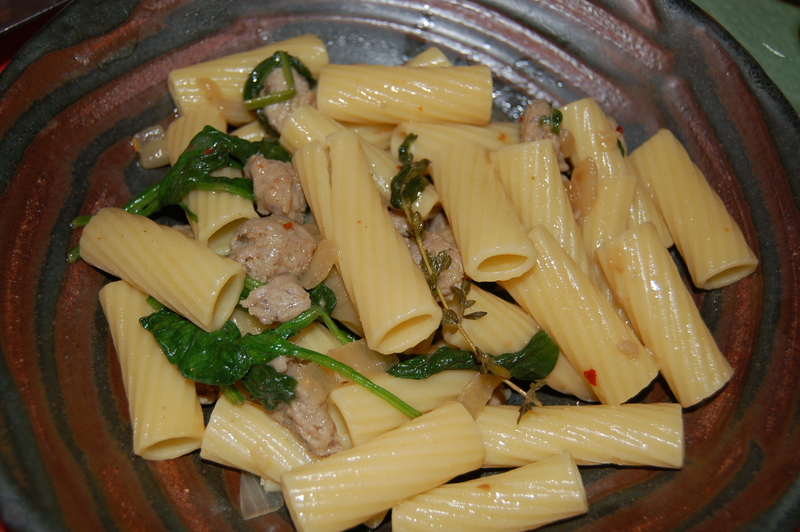 And this spicy pasta dish! The other point I wanted to make was the whole “why write this blog” business? This was the perfect time to give it up for good. I started this project nearly three years ago to document my food, but it also came from an urge to write – to write anything! I was told the only way to get used to writing was to write everyday, and not just when “you were in the mood”. The whole writing when I was in the mood had left me with a pile of half-written recipes, stories and travel-type antidotes. I decided to write about what I cooked because it felt like something solid and real and something that I could manage. There was nothing to make up: all I had to do was write about what I had done the night or day before. What’s this guy doing on my counter top! “Is there an end in sight” he seems to be pleading through the dust! As I began to write I sort of fell into a pattern, and I liked it. I became brave and began to write about other “food-related’ adventures, like where I ate or where I travelled and ate! After all, for me food is just part of living and that word living is something I hold on tightly to. I became acutely aware of my life as I was now writing it all down, and as it unfolded I realized that this was it, this was my life. No matter what I thought about, no matter what my opinions were on any subject and no matter what I wanted my life to be in the future, I could see clearly what it was in the here and now. I could read about it. And when I read and re-read what I was writing, because I tirelessly edit everything and try to stick to the truth and not some version of it, I started to appreciate it for what it was. It might have been hum-drum some days but for the most part I felt that I had better sit up and start being grateful for every little morsel of what was good. I found that I especially liked writing about something special, like the time my brother Sean ran in his 100-miler, or when I ate a sandwich on a wall in county Tipperary with my kids or when I cooked a dinner that reminded me of my mother…and on and on…dinners with friends, my sisters June and Mimi, and my lovely husband and children – all so special and so worth writing about. It was to please them, and to please me and to somehow in writing it down perhaps reach out to other people and draw them in. And they could be drawn in for all sorts of reasons: out of curiosity, because they wanted a recipe, because they wanted to look at cool pictures from someone else’s perspective or to feel some connection or familiarity to their own lives. I became aware of all of those things and somehow being a successful blogger took a distant back seat. For the first while friends or other people who read my blog would give me advice on how to become “popular”…and I just couldn’t relate. It would mean writing shorter entries and perhaps “styling” my food pictures more – it would have meant strategizing my dishes and planning the shots and the evening accordingly. It felt a little overwhelming and more like work! I then read the WordPress site and it turned that I agreed with their philosophy more than with anyone else’s. They said to be successful you should write consistently well and generally be nice – yes, they used the word nice. This is a word that is in my opinion underappreciated. If I meet someone and think they are “nice” this means that they will inadvertently go to heaven (being figurative here) because they look at all of the good and none of the bad. I could never be called nice! It seemed that WordPress wanted me to write about what I was passionate about and to hell with the rest (generally speaking). I decided to stick to my guns and keep on doing what I loved and what I had become good at: writing about the supposedly mundane events of my life and not thinking about too much else. The blog became the place I had to account to and when you feel accountable you feel an obligation in some way or another to satisfy that thing you started (especially when you family and friends ask you where you have been for the past several weeks!). I wrote pretty religiously for 32 months until my camera gave up the ghost and my kitchen came tumbling down, and that is when I asked myself the question: do I keep going or do I stop? Afterall, I had accumulated hundreds of recipes (one of my main objectives starting out) and it was not lucrative in any way so why bother. Well it seems that collecting recipes is something I can do forever (I mean there are still more ways to cook a chicken that need telling!) and things happen to me everyday that I feel compelled to write about. As for the money, well it turns out that I am happier scrounging than scheming up ways to make my blog more appealing to a wider audience. In fact I am more than positive that at this point I am not writing this for someone to read as it is way too long (although I hope someone is) and am left with the answer that I write this for myself and eventually for my children – it will probably be the only thing I leave behind (as well as some choice jewelry for my daughter and poetry books that I hope will not be donated to Goodwill or the library!). All in all I know all of his torment will be worth it! The funny part about all of this is that people have been reading my blog as much as ever and my not writing has not affected my mediocre but steady following. That makes me happy and I can’t wait to post the recipe for a great dinner I made the other night that made my daughters toes curl with satisfaction.